Do you need to sterilize baby bottle? Some believe that sterilization is not required with the current supply of water being treated and sanitized. But many parents still play it safe and sterilize their baby’s feeding bottles. Why? 1) In some countries, the water may have been treated but still contain some form of bacteria. 2) Some places, the water source is unknown. For example it may come from a contaminated well. 3) Most tap and well water are not safe for drinking due to heavy industrial and environmental pollution. Toxic bacteria, chemicals and heavy metals routinely penetrate and pollute our natural water sources making people sick while exposing them to long term health consequences such as liver damage, cancer and other serious conditions. We have reached the point where all sources of our drinking water, including municipal water systems, wells, lakes, rivers, and even glaciers, contain some level of contamination. Imagine washing your baby's feeding bottles with this water. If you are sterilizing your baby’s feeding bottles, having access to a good baby sterilizer is important. The baby's immune system is still developing making them very vulnerable to infection. As a result it is important to take significant precautions to ensure, as far as possible, that they are not exposed to harmful bacteria which could cause illness. One of the most effective ways of protecting your baby is to ensure that all feeding equipments are fully sterile prior to use. By heating water within the sterilization chamber, steam is generated which makes contact with the surfaces of the baby feeding equipment to kill off any harmful bacteria. Traditional methods such as boiling in water do of course still work. However, using a baby sterilizer is much more convenient and easy. 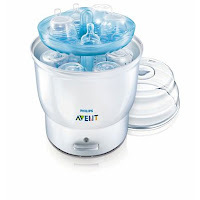 We have been using Philips Avent Electric Steam Sterilizer for close to 2 years now. No problems so far and we are very satisfied with it. Sterilization Equipment - Delhi/India Manufacturer and supplier of all type of quality sterilization equipments like autoclave sterilization, dental sterilization, steam sterilization, disinfection sterilization and wholesale supply in Delhi/NCR (Noida, Faridabad, Ghaziabad and Gurgaon). life is real... and i suggest Philips Avent Electric Steam Sterilizer. ISI, you have some really cool stuffs to offer. I think those are for business use, right? Baby Care Products- delhi/India based manufacturer and supplier of baby care products and provides radiant warmer, infant warmer, infant care, Double Surface Phototherapy, Infant Basinet, Neonatal Care System, Neonatal Intensive Care, Neonatal Radiant Warmer, Warmer With Fixed Baby Crad. Hello, I love reading through your blog, I wanted to leave a little comment to support you and wish you a good continuation. Wish you best of luck for all your best efforts. Portable suction pump, Sterilization Equipment.